TimeSnapper version 2.2 was quietly released a few days ago. Atli poured his heart and soul into providing a few features that were requested by a number of people. I'd like to give a walk through of the new features, to see if they interest you, or if you've any feedback. First up, it's now easier to see if TimeSnapper is currently recording, with a quick glance at the system tray. If TimeSnapepr is inactive (i.e, not recording) you'll see a big red cross through the tray icon. More controversial, there's a new 'Auto Popup' feature. We have this turned off by default, because it's one of those "love it or hate it" features. Please read on though, because you'll need to decide for yourself if you love this feature, and then turn it on (in the options dialog) if you do. 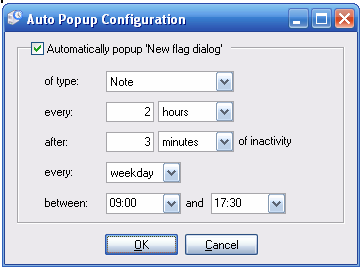 With 'Auto Popup' you can have TimeSnapper prompt you to create a new Note (or task, or flag) on a regular interval, say every half hour. This way you can be certain that there are no blank periods in your time. TimeSnapper doesn't just show the popup right when you're in the middle of typing a sentence. It waits for a small pause of inactivity. In this example, it will wait 2 hours in between bugging you. And then it will only bug you when you've been inactive for three minutes. You could equally make it ten seconds. I like this touch, as it stops the app from the kind of 'focus stealing' you get from other popup notification systems. Anyway -- enough on that feature. Download it and try it out, if you haven't already. One last improvement: there is a (little known) 'global shortcut key' to bring up TimeSnapper -- "[Windows Key] plus [S]". Turns out, of course, that this clashes with other software. So this is now configurable, via the options screen. Okay -- that's all for TimeSnapper 2.2 (aside from a number of bug fixes and optimisations). Once again we broke our rule of 'one new feature per release.' -- though it was Atli who wrote all the features this time around. Feedback much appreciated as always. The next version (2.3) could be a little delayed, as we focus on supporting, and the impending new arrivals in our personal lives ;-). Thanks for all the positive comments and feedback over the last few days since Hanselminutes. It's been a really fun time. Cheers.